6 eggplants, 6/8 tomatoes, olive oil, bread-crumbs, parsley, garlic, salt, pepper. Split the eggplants lengthwise ( the slices must be 1 cm thick) and spinkle with the salt to drain the water. Dry with a kitchen paper. Fry the slices with plenty of olive oil, press and then reserve them. Cut the tomatoes through the middle, take off the pips and the juice; brown with olive oil, strain. Slightly salt and pepper the vegetables and put them in a oven-proff dish: start with a level of eggplants, add bread-crumbs mix with garlic and parsley, then one of tomatoes , bread-crumbs mix with garlic and parsley and so on, finish with tomatoes. Baste with olive oil and bake in a hot oven 200°C for ¾ hour. Peel green asperagas, cook in boiling salted water about 7 min. plung into ice water and drain. wash and pare all of the vegetables, mince the white part of the leeks and cut off the cauliflower fleurettes (and reserve).. Sweat the leek whites in the butter (all of the butter), add the flour mixture and cook gently for 1 minute. Add the cold white stock, stir and bring to a boil while wisking. Salt and and add the rest of the cauliflower, cook gently in a covered pan for about 35 minutes. During this time blanche the little tips of the cauliflower about 3 miutes, drain and plung in cold water. Mix the cooked cauliflower and put it through a sive (un chinois), whip to lighten the mixture,place in pot, bring to a boil and check the seasoning. Sauté the langoustines in olive oil and add the asperagas tips. 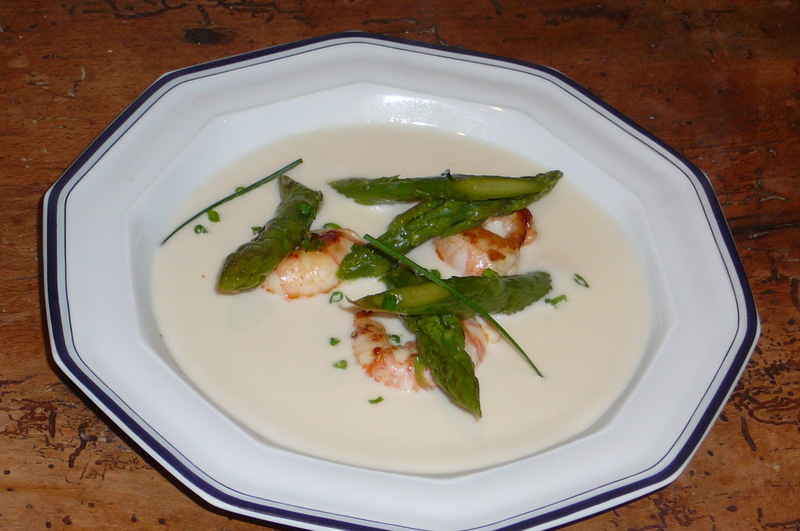 Pour the velouté into a soup dish and add the longoustines and the asperagas tips as shown above. melt chocolate and sugar, set aside. stir chocolate/sugar mixture into egg and cream until smooth. 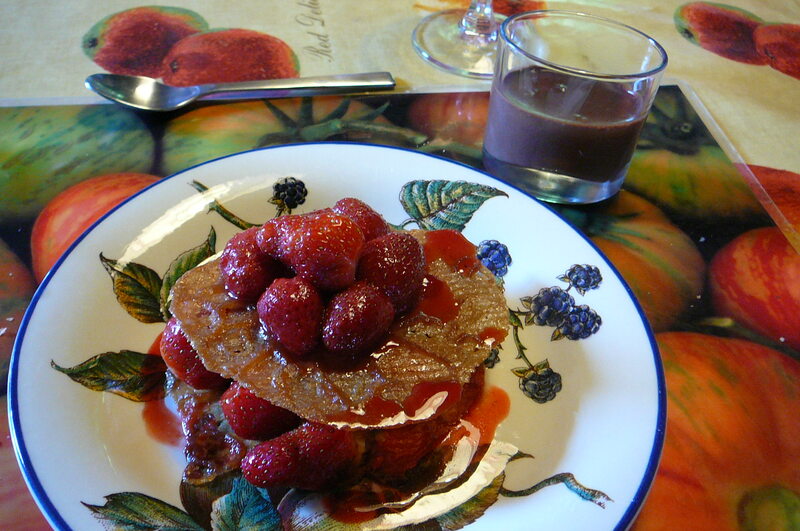 Place chocolate cream filled glass on plate or beside it to enjoy together ! This is THE french comfort food ! 500 g of tendron of veal and 800 g of breast or shoulder, 1 onion stuck with 4 cloves, 1 clove of garlic, bouquet garni( thyme, laurel & parsley), 1 carrot, 2 tablespoon flour, 2 to cup dry white wine to cover the meat, 50 g butter or olive oil, salt and pepper. For the roux: 50g butter, 40g flour, 1 yolk, 2 tablespoon of cream, mushrooms, lemon juice. Melt butter or olive oil, add the pieces of veal. Sweat the veal, sprinkle the flour and add garlic, onion, carrot, the bouquet garni, white wine, salt and pepper. About 5/10 mn, add more white wine (or water) until recover the meat. Cook gradually almost for 1 hour or cook in a pressure cooker for 30 mn. Make the roux: melt 50 g butter with 40 g of flour, thicken with 2 cups of the blanquette bouillon and ½ lemon juice. Out off the fire, mix the yolk with cream and add it at the roux. Clean, slice the mushrooms and cook them with buter. You will sprinkle them completely at the end on the blanquette in the service dish. You can serve the blanquette with steamed potatoes or boiled rice. Other option : the same recipe with lamb. cook at 155°C (311°F) for 15 minutes. 4 eggs, 3 cups of milk, 1 small cup of Armagnac or rum, 1 tablespoon of butter, salt, brown sugar and icing sugar. If the prunes are too much dried, prepare a big cup of tea and let soak the prunes. Mix eggs and sugar, add a pich of salt and flour together, add the milk, melt the butter and add it to the preparation. Buttered a cake mold, sprinkles with 1 tablespoon of brown sugar and spread out the prunes, pour the Armagnac over and pour the preparation on top. Cook in a moderate oven (200°C or 400°F) for 45 mn. Serve tepide or cold, sprinkle with 1 tablespoon of icing sugar. You can make the same cake with differents fruits: pears, apples, cherries, apricots…, cut it in small cubes and flavor with the alcool chosen and recover with the preparation.